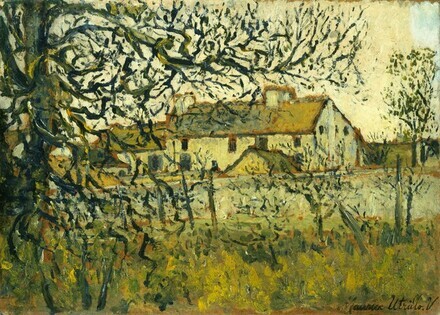 (Paul Pétridès, Paris); sold to Captain Edward H. Molyneux [1891-1974], Paris, by 1952; sold 15 August 1955 to Ailsa Mellon Bruce [1901-1969], New York, as Landscape with Houses; bequest 1970 to NGA. Letter of 6 December 1977 from Paul Pétridès, in NGA curatorial files. Purchase date of Molyneux collection according to the Ailsa Mellon Bruce notebook now in NGA archives. French Paintings from the Molyneux Collection, National Gallery of Art, Washington, D.C.; Museum of Modern Art, New York, 1952, unnumbered checklist, as Landscape with Houses. Hampton National Historic Site, Towson, MD, May - October 1956, as Landscape with Houses. French Paintings of the Nineteenth Century from the Collection of Mrs. Mellon Bruce, California Palace of the Legion of Honor, San Francisco, 1961, no. 63, repro., as Landscape with Houses. Exhibition of Paintings: Maurice Utrillo, Museum of Art, Carnegie Institute, Pittsburgh, 1963, no. 3, repro., as Landscape with Houses. French Paintings from the Collections of Mr. and Mrs. Paul Mellon and Mrs. Mellon Bruce, National Gallery of Art, Washington, D.C., 1966, no. 199, repro. Small French Paintings from the Bequest of Ailsa Mellon Bruce. Exh. cat. National Gallery of Art, Washington, D.C., 1978: 118, repro. (continuing exhibition beginning in 1978). European Paintings: An Illustrated Catalogue. National Gallery of Art, Washington, 1985: 416, repro.